PCD Tools must be properly prepared and used under conditions that will promote the highest machining performance. To maintain good quality control over the part, it is always wise to establish the life or "cut-off point" of the cutting edge (usually defined by the number of parts machined) and make a practice of changing the cutting tool at that point. If PCD cutting tools are run until they are excessively worn, they will cut inefficiently, increasing machining time and the required cutting force. This, in turn, will result in poor surface finishes and affect the accuracy and geometry of the parts. 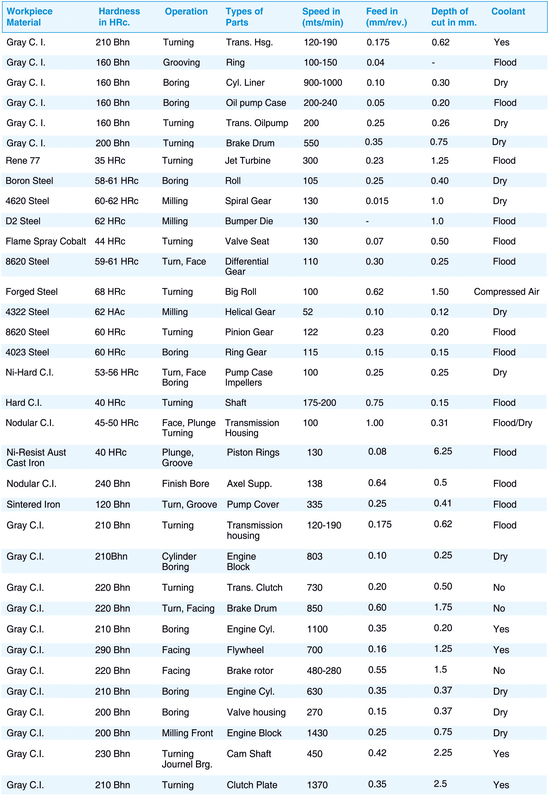 The following table provides certain machining guidelines. These guidelines show the conditions within which PCD is being effectively used to machine different materials. In general, for machining materials such as pearlitic grey cast iron, powdered metals, high temperature alloys and hardened ferrous metals (>45 HRc) where several interrupted cuts are involved, the higher percentage CBN grade is used. The higher percentage ceramic-based CBN can be used for rough and finish machining of hardened ferrous metals (>45 HRc), operations where hard turning is replacing grinding and for continuous as well as interrupted cuts in finish machining. 5. A proper chamfer should be ground on the cutting edge to minimise edge chipping and increase edge strength. Larger angles and width may be required for severely interrupted cuts. Radius honing is also recommended for severely interrupted cuts.